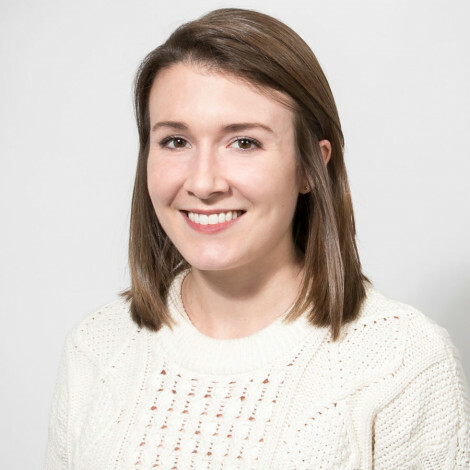 Erin Morrissey is the wellness blogger behind Erin Lives Whole. By Caroline Cunningham·	 5/17/2018, 8:00 a.m. Welcome to Sweat Diaries, Be Well Philly’s look at the time, energy, and money people invest in pursuit of a healthy lifestyle in Philly. 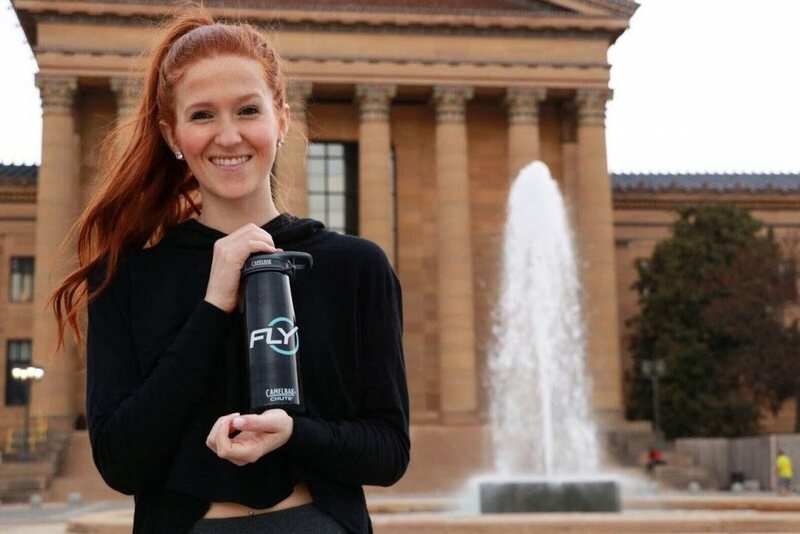 For each Sweat Diary, we ask one Philadelphian to spend five days tracking everything they eat, all the exercise they get, and the money they spend on both. Want to submit a Sweat Diary? Email ccunningham@phillymag.com with details. 6:20 a.m. — Alarm goes off, I get up immediately. I’ve never been a snoozer. Quickly brush my teeth and grab my water bottle and I’m out the door. 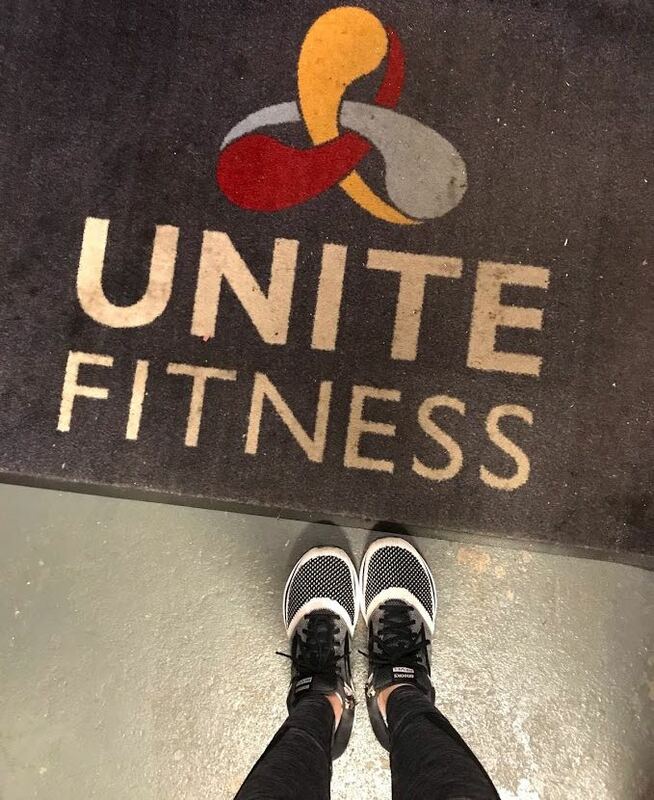 I drive over to my Monday morning workout at Unite Fitness using credits left on my ClassPass. 7 a.m. — Workout begins, I choose the bike for cardio. You can also do treadmill, but I’m nursing a nagging hip injury that doesn’t do well with impact. Halfway through, we switch to the floor for a weight circuit. 8 a.m. — I’m out the door to head home and shower. I work from home on Monday so am in less of a time crunch. I flip on the coffee maker and hop in the shower. 8:30 a.m. — I pour my coffee in a mug, add in coconut milk creamer (currently using Califia Farms), a scoop of collagen, and a little Stevia. 8:45 a.m. — Breakfast time. It’s a little chilly out, so I’m craving my all-time favorite breakfast: oats, banana, coconut flakes, and nut butter. 9 a.m. — I log onto my work computer and post on my Erin Lives Whole Instagram account. It’s a Monday, so I typically share a recipe with my followers. Today it’s Peanut Butter Krispie Quinoa Bars. I get hungry just looking at it. 9:30 a.m. — I spend the next 20 minutes engaging with the Instagram community, answering comments, and then finally get to my day-job work. 12 p.m. — I break for lunch. I’ve had two cups of coffee, and my breakfast is still holding me over, so I decide to use this time to whip up a recipe. I make a four-ingredient almond butter freezer fudge. 12:20 p.m. — I realize I don’t have too many groceries and will need to make a trip tonight. For lunch, I fry up an egg, roast a few mini potatoes, slice an avocado, and throw it on a bed of spinach. I top it with my maple tahini dressing that I put on everything. 1 p.m. — I haven’t drunk much water, so I chug about half of my Healthy Human water bottle. 1:45 p.m. — Sweet tooth is calling, and it’s time to test the freezer fudge. It was a definite win. 4 p.m. — I need fresh air, so I always make it a priority to take a little walk when working from home — one loop around Headhouse Square before wrapping up my work day. 5 p.m. — I run to Trader Joe’s and Whole Foods to pick up a few things to help me make it through the week. Broccoli, Brussels sprouts, tempeh (my favorite form of protein even though I am not vegetarian or vegan), white bean hummus, almond butter, bananas, and two Perfect bars ($24). 6:30 p.m. — I’m making a tempeh scramble with roasted veggies and quinoa, plus tons of Sriracha because I’m #addicted. 8 p.m. — I grab an apple from the fridge. I’m seriously addicted to Honeycrisp and eat one every day, I also grab one of my Peanut Butter Krispie Bars. They are amazing. I eat dessert every single night, no questions asked. Even on weekends if I’m going out, I still eat it. I can’t imagine a life without dessert! 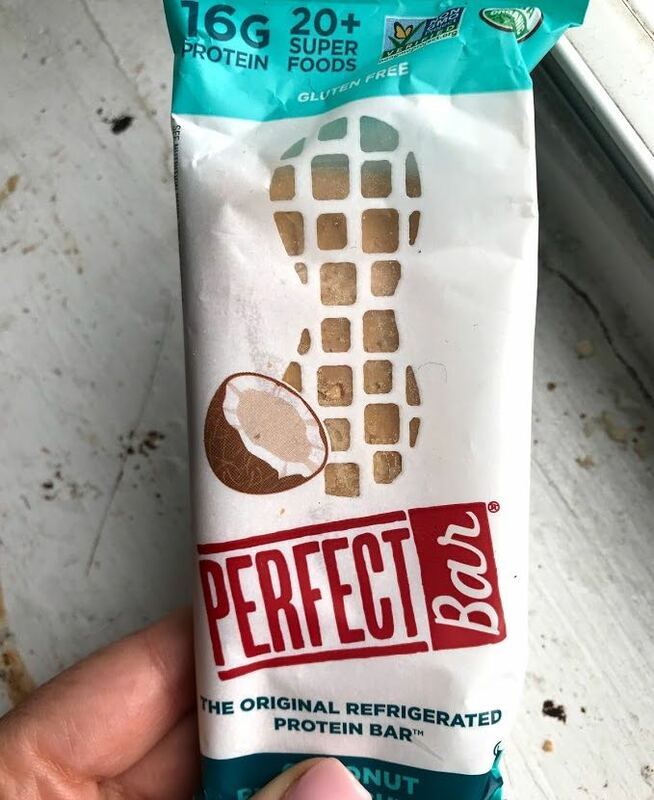 I make so many healthy treats that my freezer is always stocked, so that definitely helps. 8:30 p.m. — A few episodes of Real Housewives and a little blog work to wind down the night. 9:15 p.m. — Brush teeth, wash face, pack my bag for tomorrow, and hop in bed. 5:40 a.m. — Alarm goes off, and I’m up. 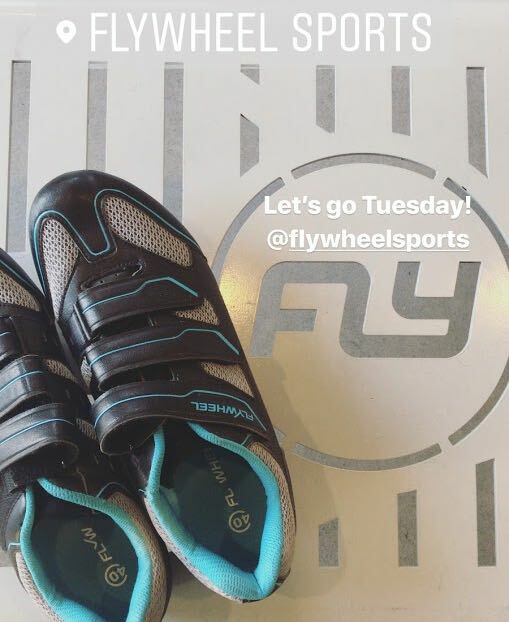 Brush teeth and head out the door to Flywheel. I try to go at least twice a week. 6 a.m. — I head into class right on time. 6:50 a.m. — I hit my PR today! It was a rocking class and I was drenched in sweat, per usual with Flywheel. I run out the door to head home to shower and make breakfast. 7:15 a.m. — I toast a slice of Whole Foods Seeduction bread (my fave), and throw sliced avocado and a turmeric poached egg on top. I take this toast to go. 8:30 a.m. — I post a picture of my breakfast on my walk to work, spend the next few minutes on the ‘gram, then get set up at my desk. In the office kitchen, I make a medium roast coffee and load it up with collagen and Stevia. 9 a.m. — Head down in work. 12:30 p.m. — My company offers free lunch every day, nice perk, eh? They have a pizza station, pasta station, carving station, global gardens, huge salad bar, soups, etc. I basically get the same thing every day: a loaded chicken salad with grains from the global section. Today they have a special farro and lentil Mediterranean blend, so I threw that on top. 1:30 p.m. — Back up to my desk to finish out the work day. 4 p.m. — That afternoon hunger hits. I have a Perfect Bar and a piece of chocolate that my colleague brought back from India. 5 p.m. — I leave work and head to a work happy hour. I grab a glass of rosé ($11). 7 p.m. — I get home, pack my bag for Wednesday, heat up leftover tempeh scramble from last night, grab three pieces of the freezer fudge I made, and call it a night by 9:30 p.m.
5:30 a.m. — Up and at it again. I always work out in the morning because if I don’t do it then, I’ve found I will make every excuse in the book not to go later. I wake up starving (still riding that post-Flywheel PR hanger) and grab a half banana topped with peanut butter. 6:10 a.m. — High Flyer class at Freehouse Fitness studio. I’m a Wednesday regular in this class, and I LOVE it. 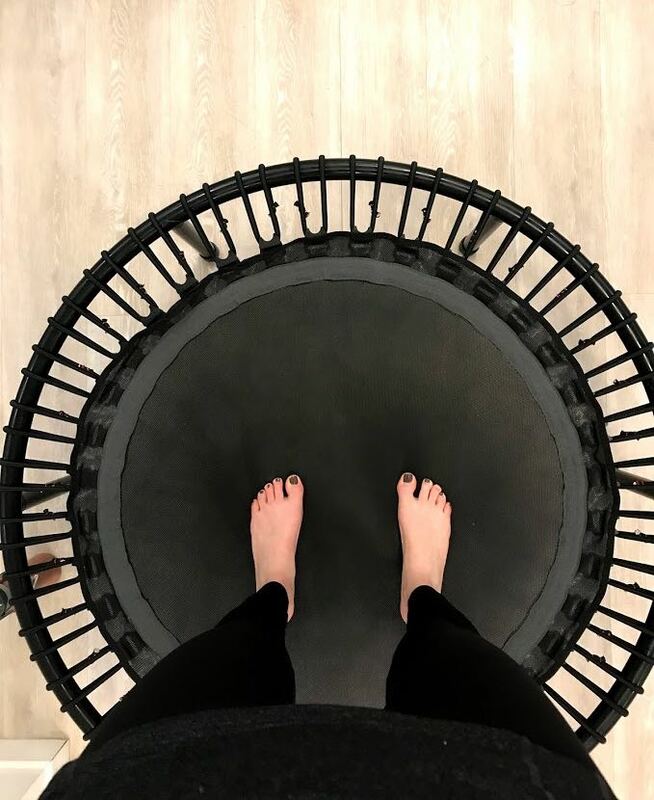 You’d be surprised at how sweaty you can get in 50 minutes on the mini-trampolines (rebounders) used in this class. 7 a.m. — I head home to shower and eat. 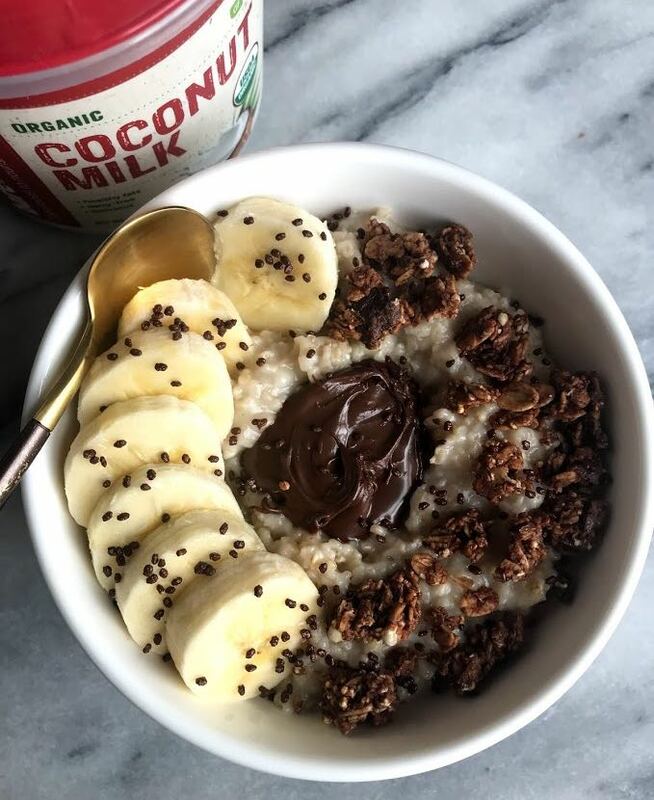 7:30 a.m. — I have time to make a “pretty” breakfast before work, so I whip up stovetop oatmeal cooked with water and coconut milk powder and topped with dairy-free chocolate hazelnut spread, the other half of my banana, and chocolate chia seeds. YUM. I photograph it, then throw it into tupperware to eat in the car #reallife. 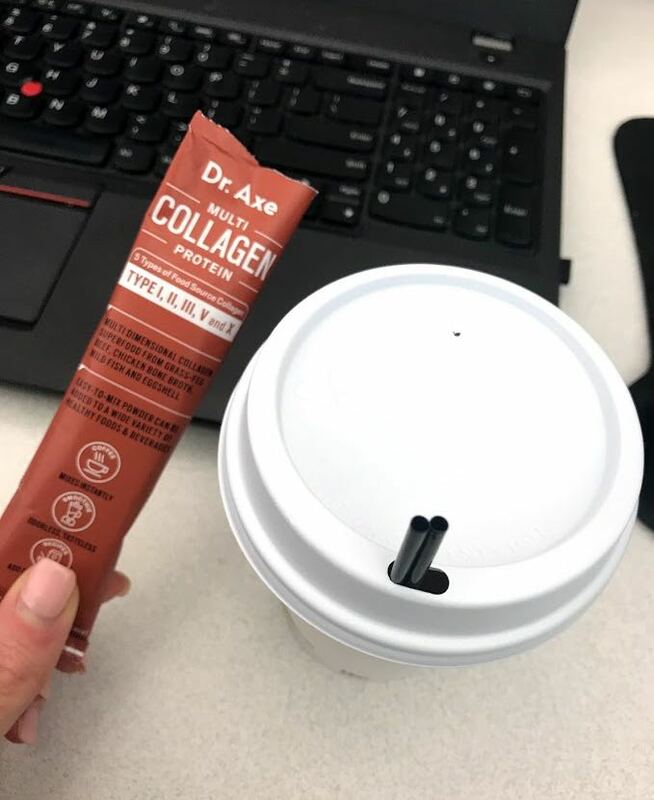 8:30 a.m. — At work, I immediately head to the coffee machine and make my usual coffee, collagen, and Stevia mix. 12 p.m. — My team is going out for lunch at the First Watch Cafe, which is next door to our office. We’re celebrating a colleague’s last day! 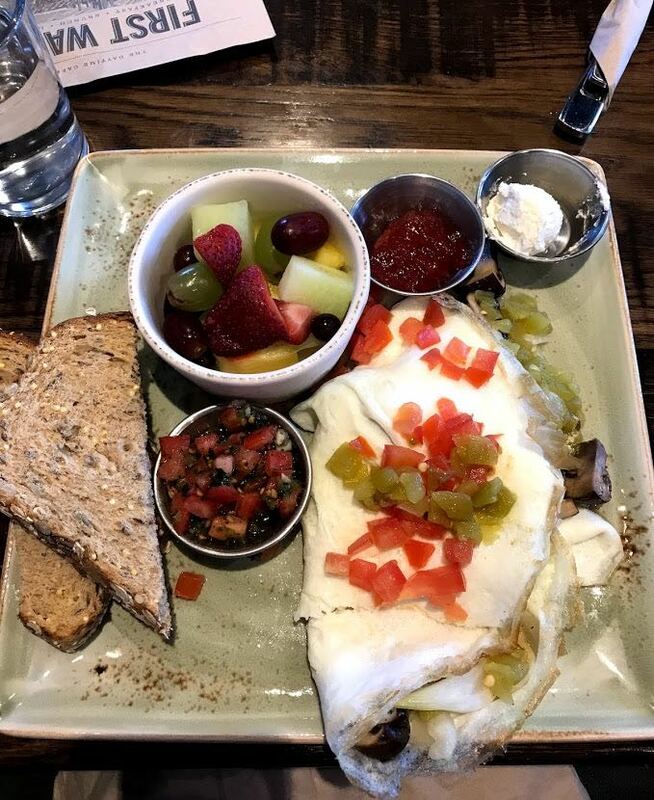 I order the Tri-Athlete — an egg white omelette with roasted veggies, homemade salsa, fresh whole wheat bread, and fresh fruit. I eat every single thing on my plate. 1 p.m. — Back to work. 4 p.m. — Day is cut short for another happy hour for the colleague who is leaving. At Firepoint Grill, I order a glass of rosé ($11). 7:30 p.m. — At home, I heat up some frozen curry that I had in the freezer and throw it over a bed of cauliflower rice. I always pat myself on the back when I remember I have some of my meal preps I created for the blog in my freezer. By the end of the day, I like easy! 8:30 p.m. — I eat an apple and two squares of my almond-butter fudge, plus some pretzels and peanut butter cause true life, pretzels are my favorite food while watching Southern Charm. 8:45 p.m. — I get another burst of energy and decide I want to make cookies for the blog. I quickly throw together a recipe for Oat Flour PB Cup cookies. People always ask me how I come up with ideas for recipes, but there’s no explaining what goes on in this brain. These just came to me and I had to try. 9:30 p.m. — I try one. The cookies are perfection — which NEVER happens on a first try. I typically make things three times before sharing the recipe, so I’m pumped and glad I wrote down the exact measurements. 10 p.m. — Brush teeth and bed time. 6:20 a.m. — Alarm sounds, and I’m glad I decided to “sleep in” — this week is catching up to me. 7 a.m. — My office has a great gym with lots of equipment (and a sauna!). I decide to try running. I haven’t been able to run in six months due to a hip issue, but I’ve been getting treatment that is supposed to help. I do one mile completely pain free! I hop on the elliptical and multitask while catching up on Instagram. I barely break a sweat, but my body is a little tired so I listen. 8 a.m. — Shower, get ready, post on Instagram, and head up to my desk, with a stop at the coffee maker. I also heat up a pack of oatmeal at my desk and throw in a spoonful of peanut butter. I also slice up a banana and put some granola on top for crunch. Easy desk breakfast, done. 12:30 p.m. — My mom actually works at the same place I do. We take our lunch outside and have a little date. I get a chicken salad again, loaded with so much stuff. 1:30 p.m. — I grab a raspberry lime seltzer water from our community fridge. Back to work. 3 p.m. — I leave work early to pick up a document from a doctor’s office. 4 p.m. — I stop at a farmer’s market, where I find the cheapest produce and have a field day. 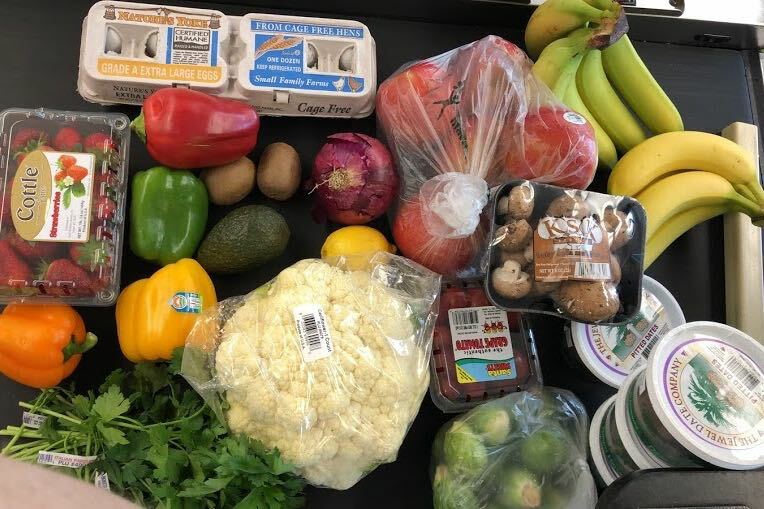 I get limes, tomatoes, peppers, jalapeños, strawberries, apples, bananas, cilantro, four containers of dates, and avocado ($28.31). I swear by finding little produce places! 5 p.m. — I get home, boil a pot of water for pasta and start baking. I’ve been craving dark chocolate brownies…so that means one thing. 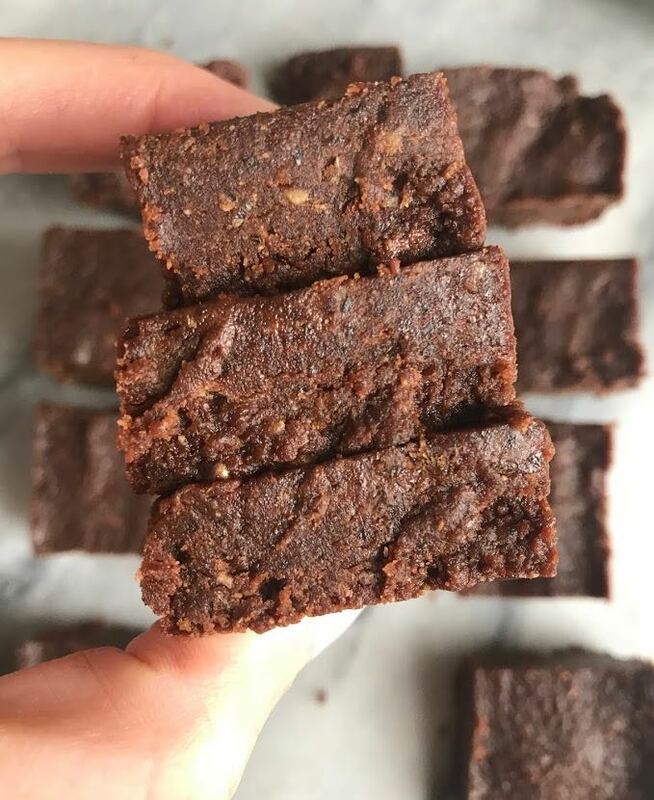 I get to work making a version of paleo brownies. 5:20 p.m. — Pasta is done, and I whip up a mac and “cheese” sauce for it. 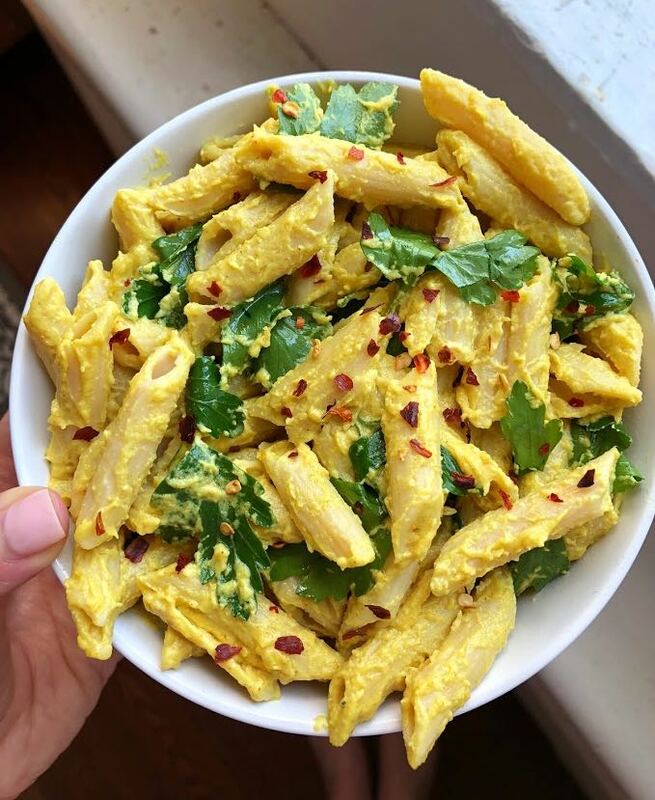 It’s vegan and made from cashews, nutritional yeast, and some seasoning. It is heavenly and I make it at least once a week. 7 p.m. — Brownies are done, and they actually turn out really darn good for a first time. I’m having luck this week! I eat one alongside an apple. The rest of my night is spent on the couch, catching up on blog work, writing a post for next week, and watching trashy TV. 6:20 a.m. — I wake up naturally before my alarm and get outta bed. I’m headed to Flywheel; it’s one of my favorite ways to kick off a weekend. 7 a.m. — Ryan kicks our butts in an extra-sweaty class. After, I head home to shower. 8:30 a.m. — I forgo coffee since I’m off work today and I’m headed home to my parent’s house later, where the coffee is better. I take pictures of the brownies I made, make myself oatmeal with peanut butter, banana, and coconut, pack up my stuff, and head out. 10 a.m. — My golden retriever greets me at my parent’s house. We head out for a walk around the block before I answer some blog-related emails. 12:30 p.m. — My stomach is grumbling, so I open my parent’s fridge and find some leftover salmon from dinner last night. Score. I throw it over a bed of greens, add avocado, cucumbers, tomatoes, and dress it with balsamic vinegar. 1:30 p.m. — I’m still answering emails, catching up on my Instagram comments and DMs. I always try my best to answer every single one, I’ve found its a great way for me to stay connected to my audience. 2 p.m. — I realized I never had coffee. GASP. I heat up a cup from the pot and add a little half and half because that’s what my parents have. 2:30 p.m. — My boyfriend is staying with us this weekend, so I run out to Whole Foods to grab Siete tortilla chips, steaks, and chicken for the grill tonight. I also grab a bottle of tequila for margaritas because it is (almost) Cinco de Mayo! My mom covers the cost of this trip. 4 p.m. — I prep a marinade for the steaks and chicken and get everything else chopped up and ready for the grill. 5 p.m. — Happy hour time! Margaritas, snacks, and diving into dinner. We have a pint of ice cream to split between the four of us for dessert. 10 p.m. — In bed and ready for the weekend!